Twenty-three days is not a lot of time to get community buy-in on a complete streets pop-up event/project and raise $10,000 in support of it. Especially in lower-income communities like Boyle Heights and parts of South L.A., where the stakeholders who would ideally be buying into the projects tend to be less familiar with concepts like “tactical urbanism,” are generally of lesser means, and/or are often unreachable via a social media campaign (or wholly unable to make online payments to it). But the three sets of groups that won Great Streets Challenge Grants in those neighborhoods are determined to forge ahead. Ride On! bike co-op founder Adé Neff acknowledged the timeline and lack of funds to do more comprehensive outreach was tough, but said he was excited to use the grant program as an opportunity to build connections along Crenshaw and between community advocates in South L.A.
Usually grants for community projects go to people outside the community, he said, because people are out of the loop with regard to funding opportunities or lack the capacity and structure to go after them. That disconnection often means that projects that do take place in the community generally fail to engage residents in more than a rubber-stamp sort of way. Meaning, any benefits that accrue to the community tend to be superficial and temporary, at best. For someone like himself, freshly out of Antioch’s Urban Sustainability M.A. program and looking to be a driver of change in South L.A., that is a frustrating landscape to be part of. To that end, he has joined up with architect Michael MacDonald of Studio MMD, TRUST South L.A., and Community Health Councils to put together a project that they hope will build some of those bridges between advocates while breaking down some of the barriers between folks in the Hyde Park area. All while making the busy intersection at Florence and Crenshaw safe and fun for a day. Google map screen shot of Florence and Crenshaw. 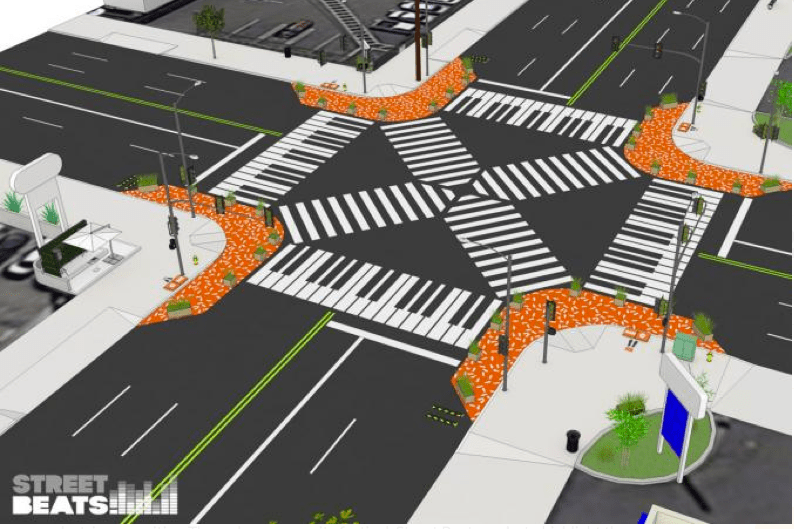 Their project, Street Beats, intends to set up the tools to let passersby make music on each of the four corners of the intersection. Putting a snare drum on one corner, something else on another, and speakers all around, for example, MacDonald explained, would require people to collaborate to create a piece of music. And the temporary reconfiguration of the intersection — possibly with chalk-drawn piano keys and street furniture (top photo) — could help engage a wide range of participants on the benefits of complete streets design without shoving engineering down their throats. In an area of town that has felt the stress of a recent uptick in violence, a streets festival with food, music, and fun could also help create a safe space for neighbors to come together and rebuild some of the trust that has been eroded. The aspiration of the Street Beats team to make connections within the community is not that different from those of Multicultural Communities for Mobility (who, together with CALO YouthBuild and From Lot to Spot, won the grant on Cesar Chavez), or of the National Health Foundation (who won the grant for Central Ave. in collaboration with A Place Called Home, Los Angeles Walks, the Los Angeles County Bicycle Coalition and the Coalition for Responsible Community Development). 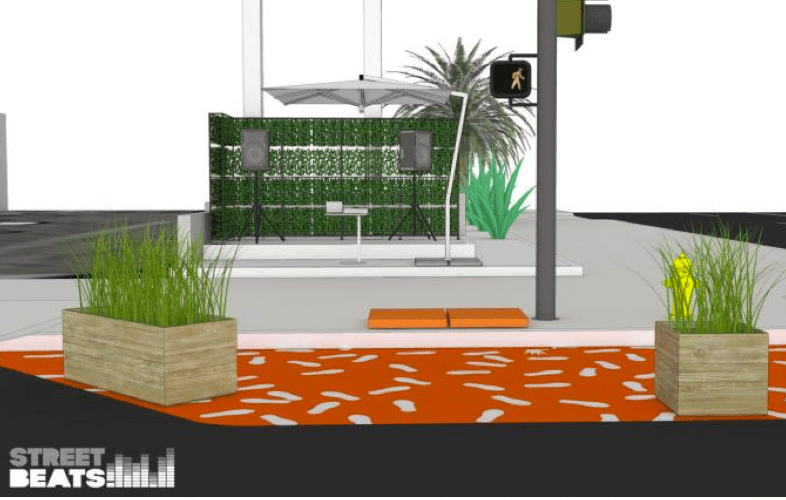 While each has different ideas about pop-up reconfigurations of their chosen streets, they are all keen to have the opportunity to connect with other community advocates and with stakeholders that tend to be excluded from the policy-making process. Betty Avila of Multicultural Communities for Mobility (MCM) said she was looking forward to building the capacity of youth from YouthBuild to aid them with outreach in a community comprised of so many different layers of interests. Once the fundraising period is behind them, she hopes they can begin a series of open-air design charrettes with the elders, musicians, families, youth, business owners, transit users, recent immigrants, and long-time residents of the area to get at the range of needs experienced by those who use the street. Although the finances may be tight — particularly because they are looking to pay the youth stipends for their work — Avila is clear that the strength of their Nuestra Avenida (Our Avenue) project lies in the partnerships they are forging. Youth from YouthBuild already got a taste of what it was like to change the course of policy in their community, thanks to the role they played in getting Metro to be more sensitive to community needs and culture when planning for development at Metro-owned lots in the area. Marrying that momentum with MCM’s experience in engaging folks on complete streets infrastructure and From Lot to Spot’s experience helping stakeholders reclaim and redesign open spaces should make it easier to gather a wide range of feedback and translate it into a coherent vision — both in plans and in the form of a one-day pop-up event — for the future of Cesar Chavez. Nuestra Avenida. A potential design for a pop-up festival to be thrown by MCM, YouthBuild, and From Lot to Spot on Cesar Chavez in Boyle Heights. The National Health Foundation’s Alba Peña is also focused on ensuring youth are part of the process of improving Central Avenue. So much so that the project is called YES (Youth-Envisioned Streets) for a Healthier South L.A.
Peña already works at nearby Jefferson High in a Health Academy program aimed at helping youth research barriers to nutrition and physical activity in South Los Angeles and develop project-based solutions. 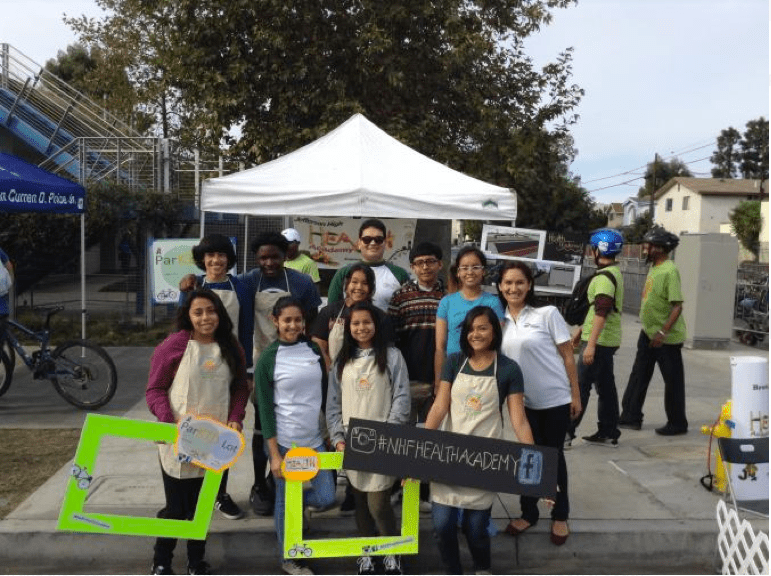 The opportunity to re-imagine Central Avenue — a street her students regularly walk, bike, and shop along — allows them to both build stronger ties with stakeholders along the corridor and put some of their ideas into practice. For the one-day street festival they plan to throw, the youth will work with L.A. Walks and the L.A. County Bicycle Coalition to design and create temporary street design treatments; build on A Place Called Home’s great garden work by designing an organic vegetable garden and planning cooking demonstrations; and design Creative Expression Outlets where people can participate in health-themed art contests, music and dance performances, and live mural demonstrations by local artists. 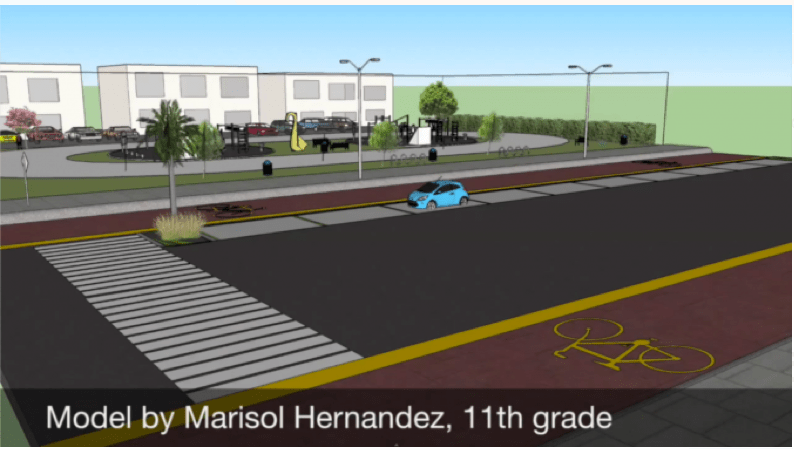 11th grader Marisol Hernandez re-envisions Central Ave. with bike lanes and open spaces. It’s a lot to for these and the rest of the grant winners to pull together in such a short space of time — especially for those who are just engaged citizens and who must fit organizing in around their regular work schedules. Once the fundraising period ends next week — six days from now — the clock begins ticking. Projects and/or pop-up events need to have been implemented by the end of February, 2016. And although fundraising is progressing, it is moving slowly for the time frame they’ve been given — seven of the eight grantees are coming up well short of their target goals of $10,000 or more. Support these or other challenge grant winners on ioby, here. 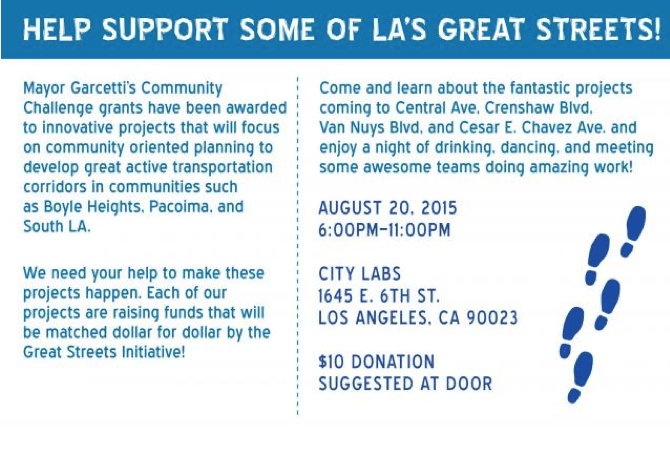 Or attend a fundraiser at City Labs on August 20th and learn more about the projects slated for Central Ave., Crenshaw Blvd. Cesar Chavez Ave. and Van Nuys Blvd. in person. Details below. Bad URL on the ioby link near the top.